Fast food workers will walk off work in seven cities across the country this week, continuing their campaign to garner higher wages and the right to unionize. 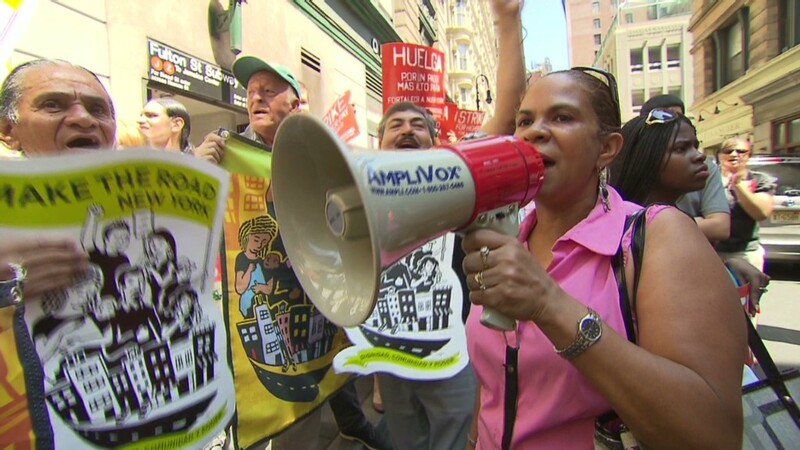 Dozens of workers asking to be paid a minimum of $15 an hour and the right to organize without retaliation are expected to protest outside of McDonald's (MCD) and Wendy's (WEN) locations across New York City on Monday. The rallies will move to Chicago, St. Louis, Detroit, Milwaukee, Kansas City and Flint, Michigan the rest of the week. The campaign, organized by a coalition of labor, community and clergy groups called Fast Food Forward, has been building momentum since last fall, when the protests first came into the national spotlight. Recently, even Washington has caught on. The White House mentioned the "low-wage worker" protests in a blog written last week by the the National Economic Council director Gene Sperling and Alan Krueger, chairman of the Council of Economic Advisers. They said that raising the minimum wage was part of President Obama's economic vision. "Marking four years since the last increase, Americans across the country are making the case for why raising the minimum wage is good for workers and the economy," the post said. Currently, the median pay for the nearly 50,000 fast food workers in New York City is $9 an hour, or $18,500 a year, according to the New York Labor Department. That's about $4,500 lower than Census Bureau's poverty income threshold level of $23,000 for a family of four. While minimum wage in New York is $7.25 an hour, food service workers may earn $4.65 an hour because their total compensation includes expected tips. Related: Obama's jobs record: Where are we now? In May, the New York State attorney general's office said it was investigating whether fast food restaurant owners have cheated their workers out of wages by paying them less than minimum wage, not paying overtime and not reimbursing for work-related expenses like uniforms or gas for deliveries. The investigation came on the heels of a study released by Fast Food Forward based on 500 interviews with New York fast food workers from McDonald's, Burger King (BKW), Wendy's and Papa John's (PZZA). Nearly 85% of those surveyed said their employer had committed at least one form of wage theft. Labor experts say there have been scattered attempts to organize over the last several decades, but very little in the fast food industry has stuck. Many say that's because there is a high turnover rate of labor in the industry.